When Holly Clegg sent me this red velvet cheesecake recipe, I nearly fell off my chair. I mean, a diabetic friendly red velvet dessert that’s this delicious and gorgeous? She’s a miracle worker! 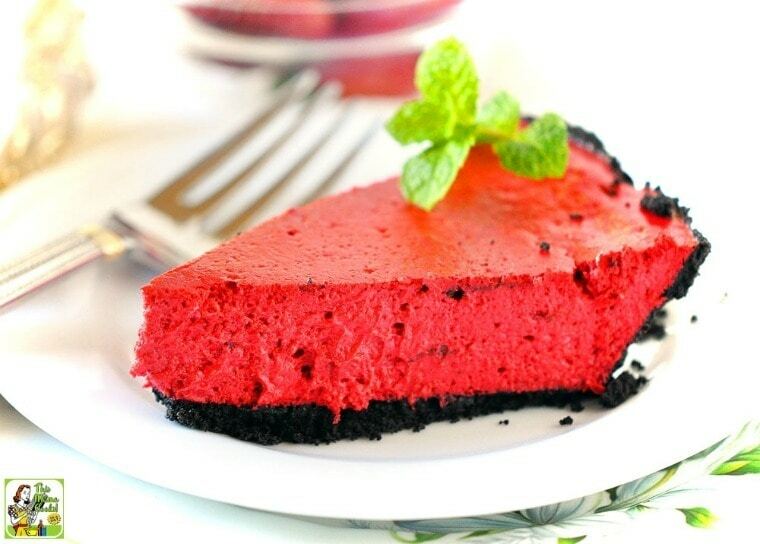 This guilt free red velvet cream cheese cake is so much fun to serve on Valentine’s Day. Bring it to the office to share with your coworkers. Or treat your family to a slice! The recipe comes from Holly’s terrific Kitchen 101: Secrets to Cooking Confidence. It’s a wonderful cookbook for the beginning cook – ideal for engagement showers, graduation gifts, or as a present. 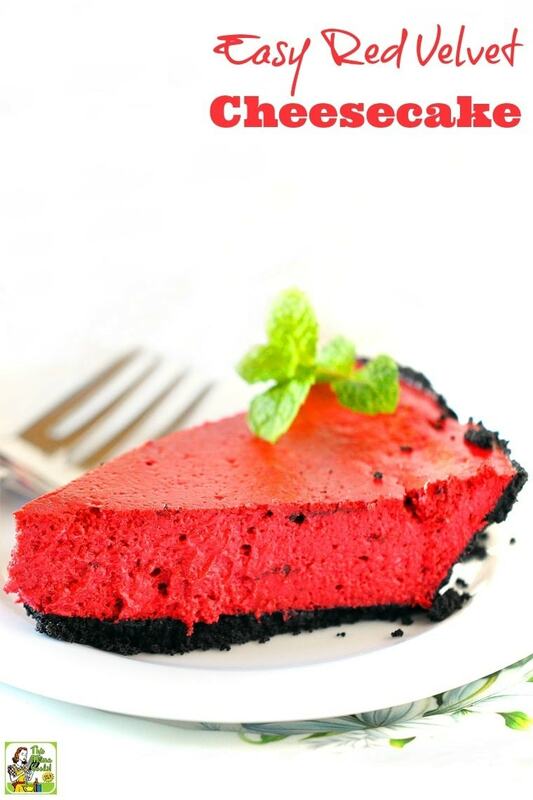 Make this red velvet cheesecake recipe even healthier by using a sugar substitute like stevia or monk fruit sweetener. To make a homemade chocolate crust, combine 1 1/4 cups crushed chocolate cookies, 1 tablespoon sugar, 1/2 teaspoon vanilla extract, and 2 tablespoons melted butter. Press into bottom of spring form pan or a ceramic pie dish and bake 350 degrees F for 10 minutes. If you’re gluten free, use gluten free chocolate cookies for the crust. If you don’t have time to make a homemade gluten free chocolate crust, I like using Mi-Del Gluten Free Chocolate Snaps Pie Crusts. You can use plain non-fat Greek yogurt instead of sour cream, if you prefer. I find Greek yogurt to be a more wholesome choice for an easy red velvet cheesecake recipe. Double to make several Easy Red Velvet Cheesecakes ahead of time and freeze for later. This red velvet cheesecake recipe is also terrific to serve up on any “red holidays” like Fourth of July, Memorial Day and Labor Day picnics, barbecues, and for over the Christmas holidays. In mixing bowl, beat cream cheese and sugar until creamy. Add eggs, egg white, cornstarch, cocoa, sour cream, vanilla, buttermilk, vinegar and red food coloring, mixing well. Pour into crusts, equally dividing the batter. Bake 35-40 minutes or until center is firm. Turn off oven and remain in oven 30 minutes. Remove from oven. Cover and refrigerate until well chilled. Originally published on Dec 17, 2012 and February 8, 2017. Updated with new photos and information.